The construction of Varna airport began in 1946 and ended with its opening in May 1948. The airport was small and flights were done only to the capital Sofia. A decision was later taken to be constructed a larger terminal in 1972 and a larger runway in 1974. Following these changes, destinations served and number of passengers increased. 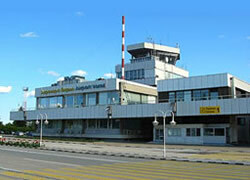 Varna Airport is situated 8 km from the town of Varna and has direct connection with international roads E-70 and F-87. Regular bus line 409 connects the airport with the town. Its route starts at Aksakovo, passing the airport, the bus station, three of the largest malls in town, the summer resorts and Varna Free University. However, the bus is not the best option if you have a lot of baggage. In this case there are numerous taxis to help you out. Verification of their fare list is almost mandatory, but some drivers take passengers to the most common destinations at already defined prices. In 2006 Varna Airport and Burgas Airport were concessioned by Fraport Twin Star Airport Management. The contracts are for 35 years and the company has high expectations for this period. Fraport plans to build a new terminal, increase the number of scheduled flights, improve service quality and divide the flow of passengers according to Schengen. Although the airport is open year round, the main flow of passengers occurs during the summer. Summer resorts near Varna attract many foreigners so the number of flights and destinations increases. This increase appears mainly from April till October. During this period, the strongest months are August and early September when the airport proudly takes over 100 flights a day. Regular perennial flights connect Varna with London, Budapest, Vienna, the Bulgarian capital Sofia and since 2010 – Moscow. Varna airport offers a variety of services both for passengers and friends. Arrivals terminal has a currency exchange office and a duty free shop, where passengers can take a walk while waiting for their luggage to be unloaded. Lost property office is located at the terminal itself, so that in the absence of baggage the passenger can immediately report to the office. There are several kiosks, offices, a bank with POS terminal and a cafeteria in front of the terminal. Departures Terminal offers its passengers a luxurious cafe, a fast food restaurant, where one can order pizza or traditional Bulgarian dishes, a shop that is well-stocked with alcoholic beverages, cigarettes, perfumes and toys and a special shop for Bulgarian goods, where one can buy souvenirs, yoghurt and wine. The terminal has a spacious terrace which overlooks the runway and aircraft parking stands, so that passengers can enjoy the sight of the serviced airplanes while waiting for their flight. Since smoking is banned in the entire building, the terrace appears to be a peculiar smoking zone.